The first album from the roots supergroup otherwise known as Kane Welch Kaplin, this record will show you why they are considered the godfathers of Americana music. wholeheartedly casting their fortunes together since 2003—don't fit the profile. (Kieran's and Kevin's) united by a fluid, rhythmic pulse that give way to an intoxicating oil-and-vinegar-like effect. This is one of my favorite cds in the singer/songwriter or Americana genre. 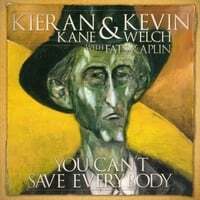 The songwriting skills and the wonderful vocals from both Kane and Welch combined with Kaplin's instrumental artistry make this cd absolutely incredible. I am so lucky that I get to see them each year at The Hardly Strictly Bluegrass Festival. I just wish they would put out more cds together! I am almost evangelical about this album (and Kane Welch Kaplan music together and individually) - I've told everyone I know about this album. It is my most played and the music touches me deeply - it speaks to the human condition to which anyone can relate but, more than that, these songs beg to be heard and felt, the lyrics paint scenes vividly in the mind, and the feelings well up inside. When I listen, I see and feel my Appalachian roots, I feel my departed mother and the spirit of the mountain ancestors from which she sprang - these songs will evoke different feelings in different people depending on life experience, but they will make you feel, and there is no greater success for an album than that. Sometimes toe-tapping, sometimes joyful, sometimes mournful - these songs will take you to all these places and more. .... but if you are looking for musical redemption, this is the album for you. It's difficult for me to believe that I first heard this CD back in 2004. It is as fresh today and it was them. There's not a sound wasted or covered by effects. Kevin and Kieran's lyrics speak of the human condition and Fats' accompaniment places the perfect musical adjectives exactly where they need to be. This is music from the souls of the songwriting masters who pioneered an acceptance and resurgence of REAL music. This is the Americana sound that Americana music is about. This album will always be a part of me and any pickin' I'm a part of. This is one of the best recordings of the past 2 decades. It has it all..great songs , masterful playing and superb vocals. Quintessential Americana. I wore out 2 copies of this. The earlier recording "11,12,13" is a touchstone for this style of music. I wore out 3 of those.